This is a guest post by Dr. Melanie Joy, who is the author of Why We Love Dogs, Eat Pigs, and Wear Cows: An Introduction to Carnism and is a Harvard-educated psychologist. In this article she talks about what she sees as a major problem in our movement: the shaming of vegans by other vegans. This is a longread, so sit back and take your time to digest the many important points she brings to the table. At a recent conference for animal rights activists, an incident took place which left me disturbed, and concerned for our movement. A speaker and longtime vegan activist was giving a presentation on effective activism to an audience of approximately 300 when suddenly, two activists rushed onto the stage. One was carrying a dead chicken; the other was holding a sign claiming that the speaker’s organization was corrupt. The chicken activist then grabbed a microphone and proceeded to announce why he thought the speaker was a hypocrite who is responsible for extensive animal suffering and why he believed the speaker’s (vegan) organization actually benefits from animal exploitation. (Despite the fact that the organization in question has an outstanding track record of promoting veganism, their mainstream approach sometimes draws criticism from more radical groups. *) The next forty minutes or so were spent in an impromptu “debate” whereby the speaker — a passionate vegan who has dedicated his life to reducing animal suffering — was forced to spend his time explaining that he does, in fact, care about animals, instead of finishing his presentation that was designed to help activists more effectively save animals. All the while, audience members cheered and hooted after each impassioned demand of the accusing activist; or, they cheered after the speaker successfully defended himself and his organization. At one point, audience members were offered the opportunity to participate, and, though plenty of them supported the speaker’s position, a number of them took up the torch and carried on something that rather resembled an inquisition. And this dynamic continued the following day, when the debate was again picked up. Nobody seemed the least bit concerned that an individual who had spent extensive time and energy preparing and delivering a talk had his presentation sabotaged — or that a human being, and committed vegan, was the subject of what I could only perceive as an attempted public shaming. Shaming is, unfortunately, a widespread social behavior whose destruction remains unchecked largely because it is so normal as to be unremarkable. And public shaming is an increasingly popular spectacle, reminiscent of the Roman Games and arguably even more damaging. 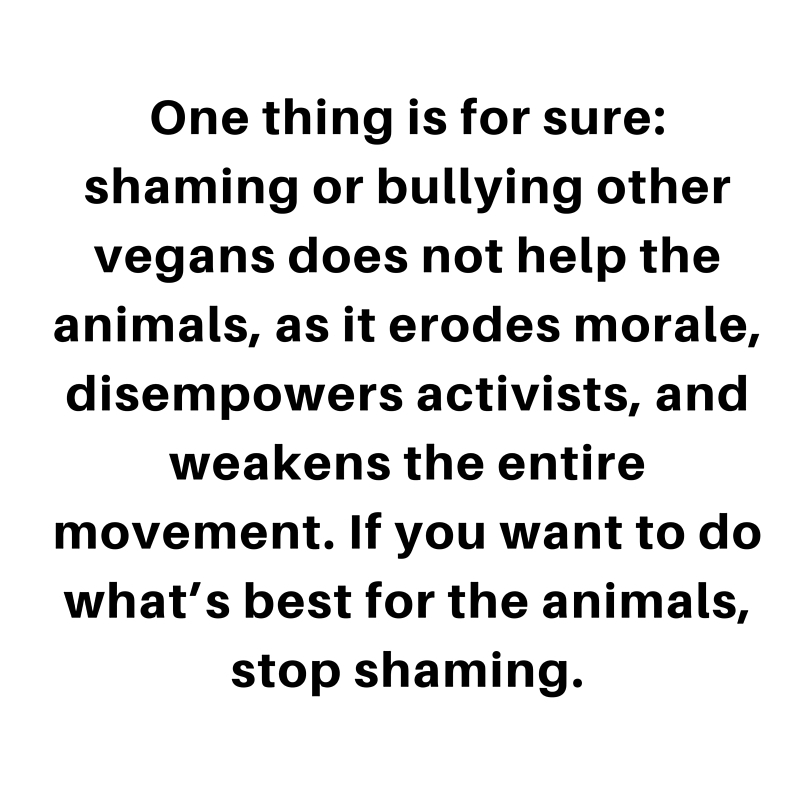 Thus, accepting and celebrating shaming behaviors is not unique to the vegan movement. 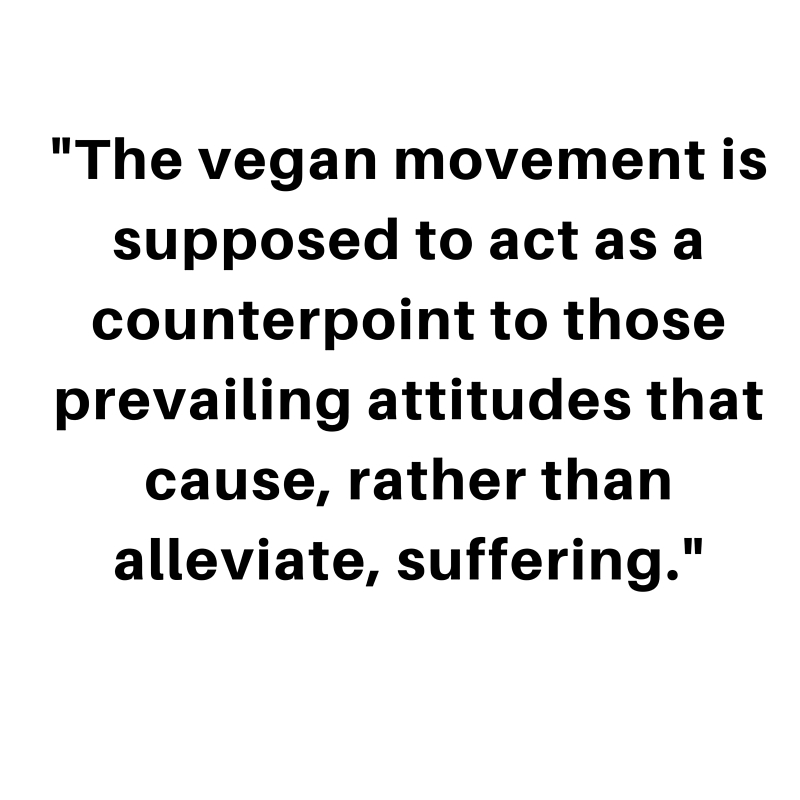 However, the vegan movement is supposed to act as a counterpoint to those prevailing attitudes that cause, rather than alleviate, suffering. Clearly, the fact that an unjust behavior is socially acceptable is not an excuse for us to uncritically adopt it. We shame others whenever we judge or degrade them, when we communicate that they are somehow inferior to ourselves or others. Shaming behaviors can be anything from a subtle eye roll when our non-vegan friend chooses a hamburger over a veggie burger to a verbal assault when a fellow vegan expresses an opinion we disagree with. Shame is the emotion that results from bullying, abusive, or otherwise demeaning behavior. Shame is the feeling of being “less-than” others. We may feel less powerful, less moral, less attractive, less intelligent, etc. Ultimately, however, shame is the feeling of being less worthy than others. When we derive our sense of worth from our activism, attractiveness, intelligence, etc. — as most of us have learned to do — we inevitably feel shame when we are put down. And virtually all of us carry around a good deal of shame; it’s just a matter of how much shame each of us contends with. We have inherited a deeply problematic world with less-than-perfect role models; even those few of us who had emotionally healthy caregivers have been impacted by a popular culture in which competition, violence, and degradation — fear-inducing and shaming phenomena — are both normal and celebrated. The flip side of shame is grandiosity, the feeling of being superior to, or “better than,” others. The inflated feeling of grandiosity, no matter how mild, can be seductive. 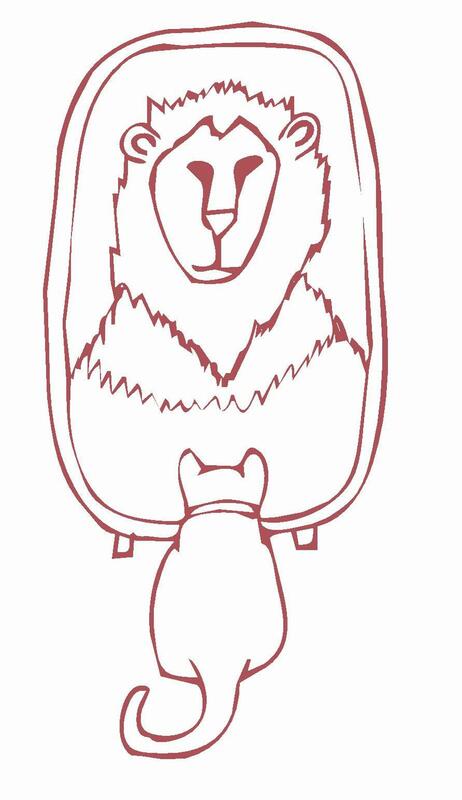 When we are in a state of grandiosity, we are on a high that keeps us (largely) oblivious to the shame most of us spend our lives trying to deny, avoid, or otherwise cover up. So shaming others can be tempting, since making others inferior automatically props us up to a position of superiority. A common example of this dynamic among vegans is intellectual moral shaming – communicating that the other is less intelligent and less moral, often because she or he does not agree with one’s own views. The goal of intellectual moral shaming is to prove one’s position as “right” and the other as “wrong,” rather than to examine and objectively discuss differing perspectives. Of course, not all shaming behaviors are attempts to boost our own egos; sometimes we shame others simply because we are attempting to get them to do something we want them to do – and we don’t realize that what we are doing is harmful. Entitlement is the belief that we deserve special privileges that are denied to others, and it is a natural consequence of being in a state of grandiosity. When we feel entitled, we feel we have the right to do to others what would be unacceptable for them to do to us. For example, recently a (vegan) colleague of mine was questioned by another vegan about his approach to animal liberation. My colleague replied that he was a staunch proponent of the abolition of animal exploitation. Yet when my colleague added that he supported a different strategy toward abolition than did the questioner, the other vegan – who was a veritable stranger to my colleague – insisted that my colleague didn’t “really care” about ending animal suffering and that he was not, in fact, a proponent of the abolition of animal exploitation. The vegan felt entitled to define my colleague’s identity for him. He felt entitled to claim that my colleague’s self-assessment was wrong — that he knew better than my colleague what my colleague’s own personal philosophy and goals were. At the conference, though I was disturbed by the the accusing activist’s behavior, I was far more concerned by the fact that he was able to carry out his acts of sabotage and shaming because others gave him the platform on which to do so — because so many activists apparently shared his belief that “moral might makes right.” In other words, they believed that it is acceptable to bully, shame, or otherwise violate another as long as the attack stems from a sense of moral righteousness. When I asked the activist, for example, why he felt entitled to violate a speaker’s space, and potentially traumatize him (and onlookers) by forcibly exposing him to someone’s corpse – behaviors that are frighteningly reminiscent of animal abusers – he replied that it was because “the speaker crossed an ethical line,” a statement to which the crowd cheered. Psychotherapist Terrence Real, who specializes in abusive relationships, calls this kind of behavior “offending from the victim position.” All abusers, Real points out, feel a sense of righteousness and believe they are defending themselves (or, in the case of animal rights activists, that they are defending others) when they are carrying out abusive behaviors. A batterer, for example, almost always says he hit his partner because she did something to hurt him: “She knows I can’t stand it when she complains about the way I treat the kids, but she just couldn’t keep her mouth shut.” In the abuser’s mind, his partner crossed a line – a subjective line that he constructed and that he decided would mark the boundary of justifiable violence toward her. In the moral might-makes-right paradigm, abuse is not abuse if the behavior stems from a valid moral grievance. And of course, the person who decides whether the grievance is valid is the one acting out the behavior. Just consider the 9/11 terrorist attacks or the many American school shootings, violent acts committed in the name of moral righteousness. While these examples are obviously far more violent than the vegan who publicly shames other vegans (or non-vegans), the underlying mentality is similar; the difference is simply a matter of degree. Most people would agree that practicing integrity precludes shaming. Integrity is the integration of values (such as compassion and justice) and practices, and when we shame others, we violate such values. So, shaming others — vegans and non-vegans alike — is simply unethical. But even if we care little for the ethical consequences of shaming, such behavior has practical consequences as well. 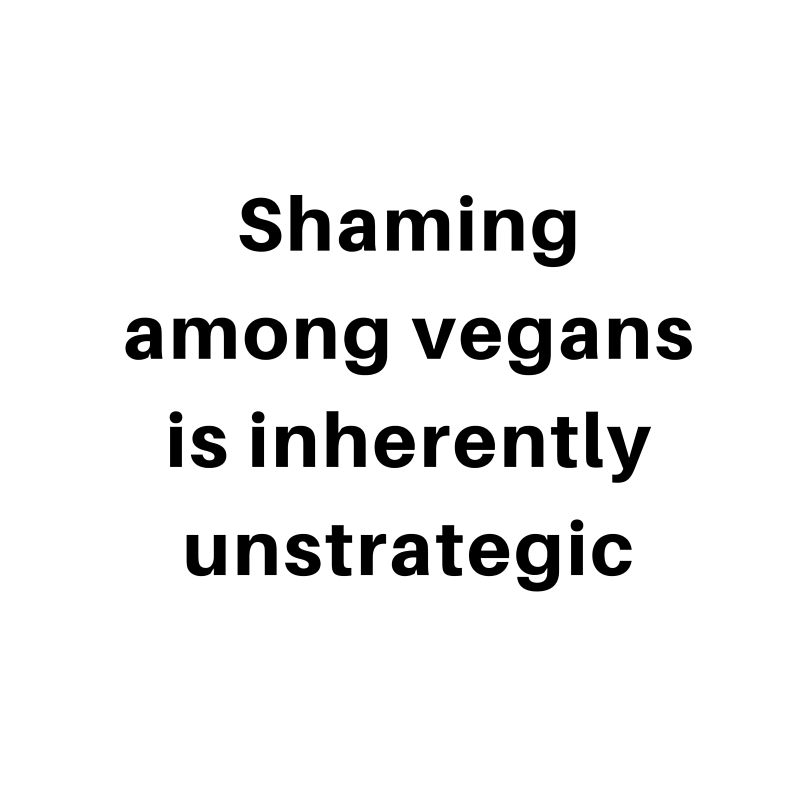 Shaming among vegans is inherently unstrategic; it turns off non-vegans whose support we need if our movement is to succeed, it disempowers vegans, and it causes a tremendous waste of time and energy that could be directed instead toward effective vegan activism. When we shame another, we increase the likelihood that she or he will withdraw or attack in self-defense. Shamed people may fail to act on their own or others’ behalf because they don’t feel they have the power to bring about change. Consider the young woman who witnesses the horrors of factory farming, wants to stop eating animals, but cannot withstand the peer pressure to conform to the carnistic norm when she is called “radical” by her peers. Sometimes shamed people attack rather than withdraw, and they shame others as a way of (temporarily) building themselves up. Consider the boy who falls and scrapes his knee on the playground, starts crying, and is immediately teased by his peers for being a “girl” (unfortunately, calling one a female is among the most offensive of slurs). He pulls himself up, puffs out his chest in an “I’ll show you!” stance, and attempts to bully and shame the others. Psychologists have long known that shaming behaviors are inherently abusive, and that shaming others is the best way to bring about the very opposite of what we desire (unless we are cult leaders, guards of political prisoners, or otherwise seek to disempower and “break” the other). 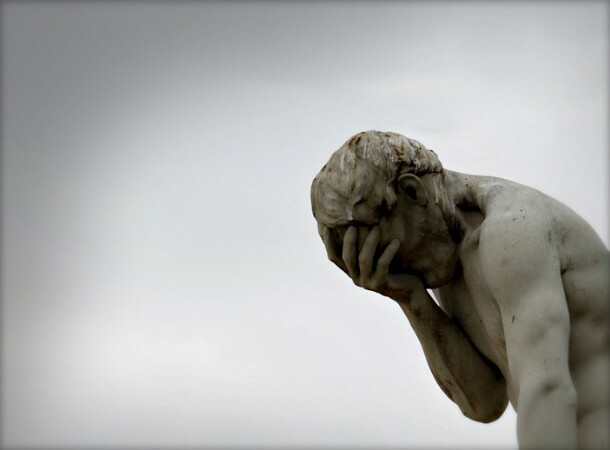 Because shame is so personally and socially debilitating, it is the emotion the dominant culture instills in those who challenge its oppressive practices, effectively silencing dissident voices (how many times have those of us who are vegans bitten our tongues for fear of being told we are “overly sensitive,” “extreme,” “irrational,” or “morally misguided”?). Vegans are no strangers to shame; we must struggle against it every day as we swim against the tide of the dominant culture. Often, vegan shaming in the dominant culture is expressed in two ways: vegans are either too visible, or invisible. When we are too visible, our attitudes and behaviors are scrutinized and cross-examined, leaving us little room to be the fallible humans that we are and causing us to adopt a sort of “toxic perfectionism.” When we are invisible, our efforts are denied, invalidated, or otherwise obscured. When vegans shame each other, they reinforce these shaming, extremely damaging attitudes. Vegans are often held to impossible standards by the dominant culture: we are expected to be paragons of virtue (we’re hypocrites if we wear silk, extremists if we don’t), models of health (if we should happen to fall ill, our entire ideology comes into question), and experts on everything (we aren’t allowed to advocate veganism unless we have all the answers to the problem of carnism – which, of course, we cannot). Also, many vegans are highly sensitized to the idea that they could cause harm, be immoral, or not be “good enough,” and they have internalized the dominant culture’s message that they need to be perfect in order to be worthy. They struggle to accept that their efforts are sufficient, and often do not succeed. So toxic perfectionism is, not surprisingly, a common cause of depression and burnout among vegans. 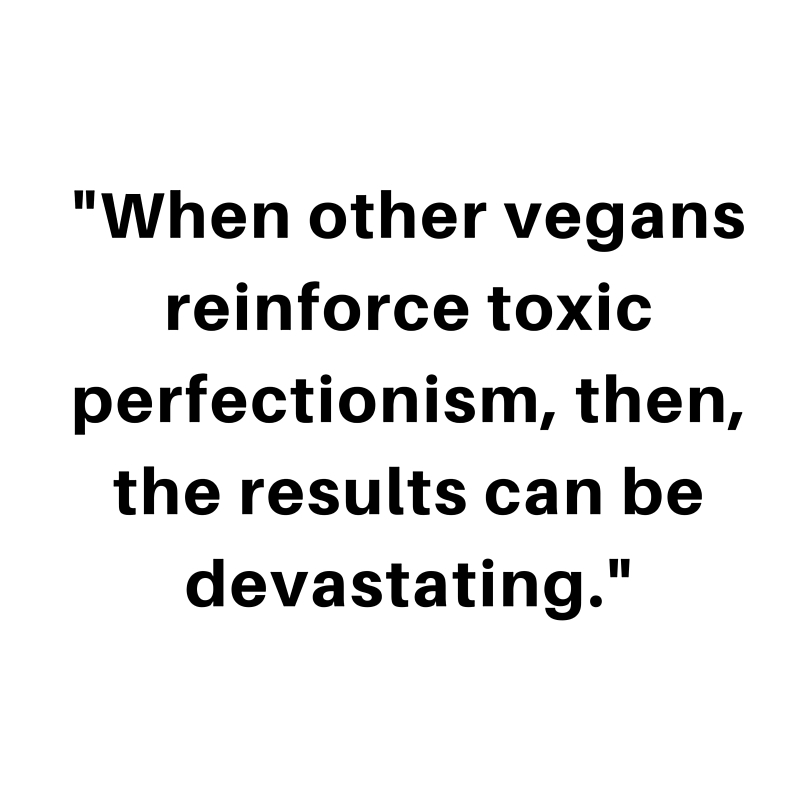 When other vegans reinforce toxic perfectionism, then, the results can be devastating. A common example is insisting that if one ingests even a trace of an animal product, such as drinking “non-vegan” wine or eating soy cheese that contains casein, she or he is “not a real vegan,” and is by extension an animal exploiter (an attitude that no doubt also scares many new vegans and potential vegans off). Toxic perfectionism also causes us to reduce the individual we are judging to nothing more than the “shameful” behaviors for which we are judging her or him. We fail to appreciate the other as a whole individual, as we erase any parts or her or his activism or life that contradict our judgment. For example, one controversial campaign of an organization that’s done tremendous good for animals can lead to it being criticized as a “sell-out” or a colluder with the oppressor. Even when the numbers objectively don’t add up — when the individual or organization has statistically done far more “good” than potential “harm” — toxic perfectionism causes us to mentally invalidate such data. When vegans promote toxic perfectionism, they can create an excessive fear in other vegans (and themselves) of making mistakes. One slipup, one admittance of not being “pure” enough, can lead to being shamed. 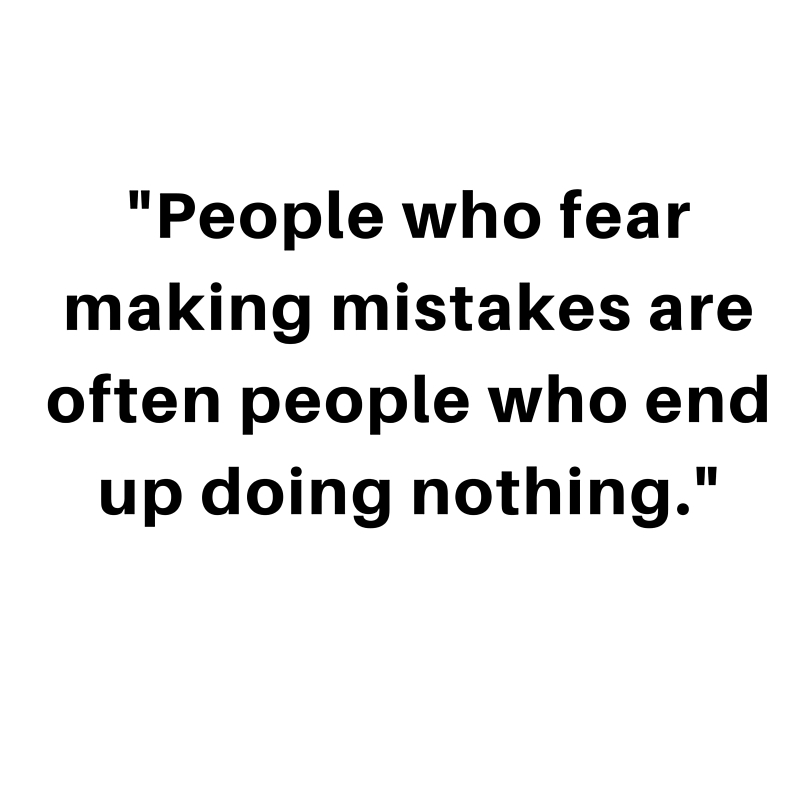 People who fear making mistakes are often people who end up doing nothing. Ours is a thankless job. As vegan activists, we often work tirelessly, for no money or for far less than we would otherwise earn, and we do so for no reason other than that we care. The animals cannot thank us, and never will. Our efforts are frequently invisible, ridiculed, or even fought against by the dominant culture, sometimes even by those with whom we are in the closest relationships. So when our fellow activists, the only people in the world who truly “get” what it means to be a vegan in an animal-eating world, do to us the very things the dominant culture does — calling us hypocrites, ridiculing us, and attacking us — we can become demoralized. Clearly, we feel assaulted by attacks. But perhaps an even more insidious feeling is that of being deeply unappreciated, a feeling that can lead to despair. A desire for appreciation is not selfish or egotistical. It is a basic human need which, when not met, saps us of our motivation and inspiration. If you doubt this just think of how you feel when your partner fails to acknowledge that you’ve been the one cleaning the house since you moved in together. It would be tragic if vegans agreed on everything. Our diversity is our beauty, and our strength. However, the the way we disagree matters. It matters very much. When we come together to discuss, rather than dispute, our differing ideas, we can enrich ourselves and our movement. In such a situation, we approach our disagreements with curiosity and compassion. We are open to learning from one another, and, even when we feel strongly about an issue, we don’t shame or violate the other. We empower, rather than disempower, ourselves and our movement. Empowerment is the opposite of shame. 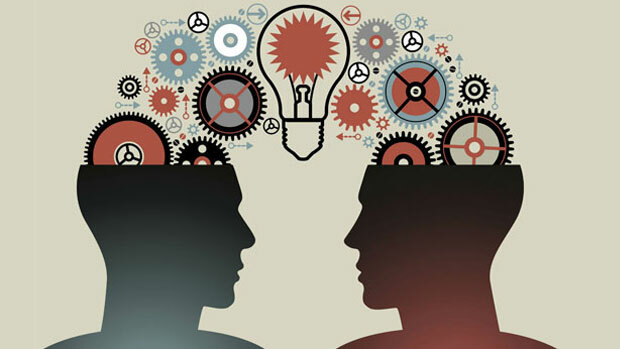 We can reduce the likelihood that we will shame another if, before we communicate, we stop and ask ourselves, “Am I connected to my empathy right now? Am I truly considering how the world looks through the other’s eyes — how my words or actions will feel to her or him?” Or, “How would I feel and how would I react if someone said this to me?” These questions are particularly important if we feel angry or morally righteous, and/or if the other is a leader or organization, whereby it’s easier to view them as simply a symbol, rather than as a human being or an institution made up of human beings. Often we forget that underneath the role of CEO, author, speaker, etc. there is a person with feelings, wants, and needs, a person who will be impacted by our words. And we forget that our organizations are made up of activists who are people who care very much about the cause and the impact of the work they are doing. And before we communicate we can also ask ourselves, “What is the goal of my communication? What impact on animals do I hope this communication will have?” Many of the vegans who shame other vegans do so from a place of genuine concern, believing that the other’s approach to reducing animal suffering actually harms animals. 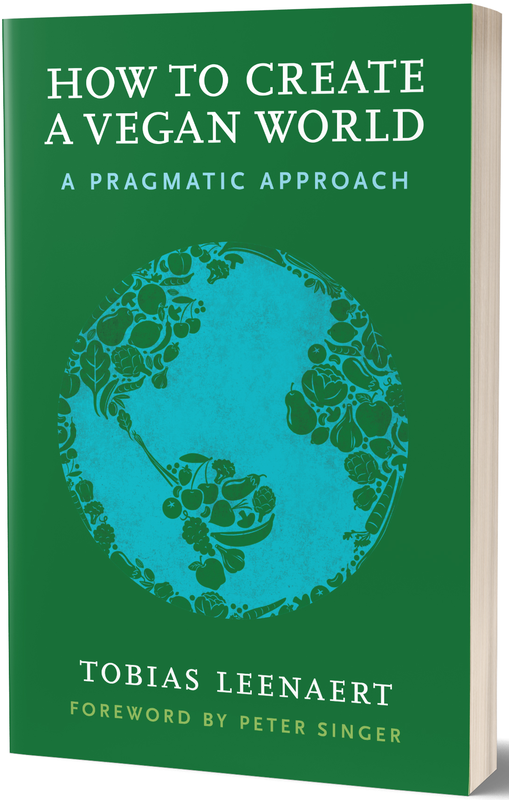 Some strategic approaches are no doubt better than others, and without solid data (which, when it comes to broad strategies for animal liberation, we simply do not have) it’s difficult if not impossible to know what approach is most effective. So we need to continue talking, discussing, analyzing, and learning. But one thing is for sure: shaming or bullying other vegans does not help the animals, as it erodes morale, disempowers activists, and weakens the entire movement. If you want to do what’s best for the animals, stop shaming. The most important way we can create a shame-free culture is to do everything in our power to take away the platform of those who shame. Shamers would not have the impact they do if they didn’t have an audience. It is my hope that vegans will choose to become allies in creating a more compassionate and thus more powerful movement — to commit to creating a culture that is inoculated against shaming (of non-vegans and vegans alike). To do this, we can create shame-free zones everywhere in our power: in our conversations and organizations, at our conferences and gatherings, and perhaps most importantly, on our social media pages, since social media is often the most prevalent source of widespread shaming. The majority of vegans are highly conscious, compassionate individuals who are deeply committed to personal integrity and social transformation. 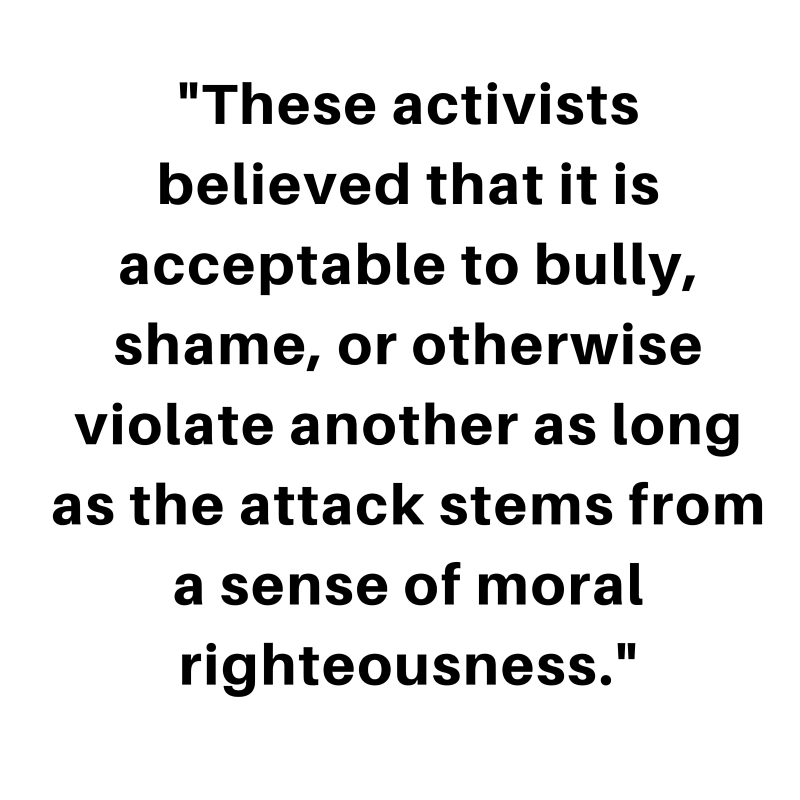 It is likely that our movement has gotten to the point where shaming is a problem partly because we have uncritically accepted the “moral might makes right” myth, and largely because those of us who do not shame have not paid the phenomenon much attention. 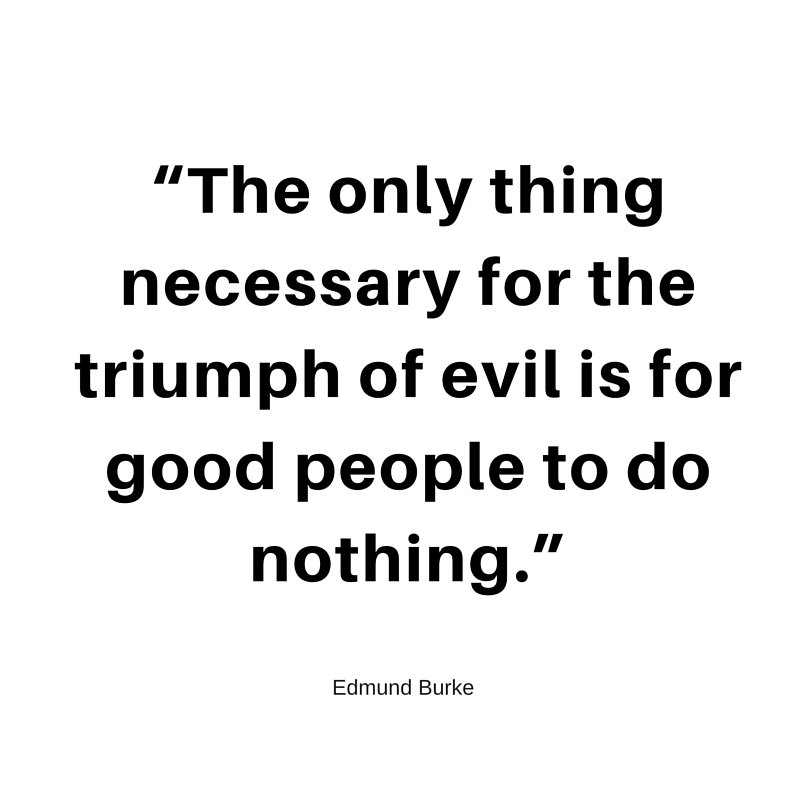 So we have ended up as inadvertent bystanders, enabling a problem simply by not addressing it. Shaming damages our movement. As vegans, we do not have the luxury of oblivion; we cannot afford to simply gloss over hostile statements or ignore demeaning comments. We must do what we do best: act as critical consumers and encourage others to do the same. We must examine not only that which we put into or on our bodies, but that which we take into our hearts and minds, and promote compassion over cruelty. *Of course, different ideological approaches can raise legitimate questions, from both sides. However, the focus of this article is on the way we approach such questions, not the questions themselves. Fantastic read. So insightful and so very apt to read this right now as this has been on my mind so much over the last few months. This culture needs to end; it does nothing but damage. I myself have been part of this shaming culture and it does nothing but cause misery. The animals certainly don’t benefit and surely that’s what it’s all about? I value Melanie Joy’s article here. I strongly believe that it is vital that we people increasingly learn to reason through all our actions as well as our sub conscious impacts. I like the question about whether our empathy is ‘switched on’ or not and asking whether we are ‘truly considering how the world looks through the other’s eyes – how my words or actions will feel to him or her’. This is so very important too. But I mostly thought as I read her article, that veganism is in my view, as I hope I continues to evolve and develop my ideas as a vegan, a BIG word. I now think it stands for ‘do no harm, do good, promote true autonomy and justice (some fundamental ideas of ethics used by Beauchamp, T & Childress, J. I currently think that this is so because many things not associated with veganism in fact harm animals including people in that group biologically. Such things include for example the oil industry and our involvement with oil based products and our involvement with industries depending on toxic pollution! So I currently conclude, in agreement with Melanie Joy, that vegans have to develop their humility and compassion towards each other. We are all a long way off being perfect if we chose to look. Life is not simple. It is complex. This does not excuse our non-vegan actions (I am certain most vegans have them if they really looked hard and fast at the different parts of their lives – I certainly do and can but gradually hope to eliminate them). I strongly agree that it is not possible to make a final judgement about another person’s intentions. On my journey as someone who does want the world to be vegan – for all the main reason, I quite commonly come across to others perhaps as ‘quite relaxed about their not being vegan’. In reality I am not at all, but it is my way to get to understand them, value them and even ideally to help them to start their journey to realising that non-veganism is not ok (that is my view!). Any vegan attacking another vegan, must ask some questions about how they became vegan, how long did it take, and how vegan are they actually with a bit of extra analysis on the subject! I too was at that conference. I was quite taken aback that the organisers didn’t insist the ‘protesters’ left the platform. As you said, the speaker (as all speakers do), put in a lot of hard work, and were given a slot. The fact the organisers allowed the protestors to hijack their own 20 minute slot, makes it look acceptable to do this. Yeah, I was just thinking that while reading this: where were the organisers? I’ve put on numerous events as part of other work I do and would have been horrified were any guests that we had invited to be treated like this. I feel, as organiser, it would be my role to intervene. I certainly wouldn’t have joined in! So timely! I talked with two vegans this morning who don’t even want to refer to themselves by that name because they are so sick and tired of other vegans being on their case for not being ‘vegan enough’. It’s ridiculous. If you can’t support others for doing their best to help animals, then just keep it to yourself. No one has a right to condemn and judge people who are basically total strangers, simply because they don’t live up to ‘your standards’. That’s not advocacy. It’s anti-advocacy. Just stop. The timing of this article is spot on. We’re seeing more and more shaming and it just isn’t helping. Just yesterday some close friends of mine were shamed at a protest (of which they were making a valuable contribution). They ended up leaving early feeling disillusioned and cast out. Part of the shaming culture, I think, is down to the internet. A lot of people separate their actual selves from their online selves. They treat and talk to the people they interact with online very differently to how they treat the ‘real’ people in their lives ie. those actual people they meet daily at home, work etc. I think we all do this to some extent. Try and show the best of ourselves online – more confident/ vivacious/ sociable/ beautiful versions of what we really are. Facebook and twitter etc. give us our own little ready-made Truman’s show and we play to the cameras. But, like this article says, when online people become mere avatars to us, part of a game, maybe, but totally separated from real life and one’s real life ethics, that’s when the problems start. Flame wars can be infuriating, but ultimately something most people can walk away from back to their actual lives and forget. But for others, those very same exchanges can have a much more destructive impact. There’s so much in this article that we call can learn from and apply to our lives, and not just in relation to veganism or activism. Thanks so much for writing it, Melanie, and to Tobias for sharing it. Moreover, during the beautiful talk (and documentary premiere) given at the same time by founder of Indraloka Animal Sanctuary (who arrived from US) the auditorium was almost empty because of this shaming debate and people following the sensation and fights. It was really unfair and disrespectful. Brilliant and so insightful essay. THANK YOU! First thing I thought was that these so called protesters may have not been vegan or even activists at all . Who in their right mind would be so disrespectful at a conference about empathy and compassion. What horrible role models. Personally, if I have issue with something or someone, I think, given the gravity of the work, it should be communicated to them in private. Too many looking for too much to say is wrong with the movement anyway. No reason to provide more fodder. You are using a light gray type on white background. I already know you have much important stuff to say, but this makes my eyes water trying to read it. If it’s worth saying, say it BLACK type on white. Not even trying to read what is probably an important message. I’ll wait for you to say something that doesn’t hurt my eyes to read. Reading this I can’t help but sense some irony, the term “carnist” has become just a derogatory term for non-vegans…..I’ve been called this so many times I’ve lost count. Now I doubt that was the intent….but that’s the reality. And I’m sure the people mentioned in the article mean well too, but that isn’t how it works out either. But, once you remove all the things mentioned in the article….what is left of veganism? A boycott with no underlying rational. Why should the term carnism be derogatory in its definition? Perhaps some vegans use it in a derogatory manner and I’m sorry if that did happen, but as a purely technical term it does make sense. On a side note I have been accused in the past of insulting people because I have called them cis-gender. (The dominant gender identity) These people were deeply offended as I assigned a label to them that was not familiar and ultimately unwanted. Sometimes we need more clear-cut definitions to describe things. Carnism, like veganism is an ideology. These terms should not be confused with omnivore, carnivore or herbivore which are based on biology rather than ideology. Its not so much that the term is derogatory in its definition, but that its frequently used as a derogatory term for people that aren’t vegan. I’ve heard the term used against vegetarians, semi-vegetarians, etc….basically anybody that isn’t vegan. I wouldn’t consider the practice of eating and using animals to be an “ideology”, they are cultural practices and like all cultural practices they are done without much thought from the members of the culture. For example, every morning I get up and put on some sort of pants and shirt. Is this rooted in some sort of pant-shirt ideology? But my point wasn’t to debate her thoughts, instead pointing out that what I assume was good intentions has turned into what is described in the post. Just between vegans and non-vegans. this is exactly the point of defining people who choose to willingly support the exploitation and murder of non-human animals as carnists. choosing which clothes to wear is a personal choice which only effects you. choosing to consume flesh, dairy or eggs is a choice which has a tremendous negative impact upon other sentient beings and which is based upon an ideology of classifying non-human animals as mere commodities and as property rather than the sensitive, feeling individuals which they are. when considering any form of violence or social injustice, it is imperative not to ignore the victims point of view. just as the support of human slavery is an ideology, so is the support of non-human slavery. This sort of moralizing isn’t related to my point, many cultural practices have moral implications in the perspective of western thought. What I was pointing out is, more or less, the distinction between a cultural norm and an ideology. Ideologies are variants within a culture that people, at least to some degree, decide to uphold and usually for some particular reason. On the other hand cultural norms are the standards we live by and are learned, rather mindlessly, as we grow up. But over time things can change, what use to be a norm can become a variety of acceptable ideologies within the culture. Perhaps we are moving in that direction and some think giving the practice of using animals for meat, etc a name will speed that process up…..but I don’t think so and at the moment this practice is still a cultural norm. But beyond being pedantic, I do think this distinction has practical implications because changing ones culture is a lot different than changing an ideology one may have. To me a non-vegan (maybe with the exception of Mr. Toad:-) is in the state of denial. I know Joy wants to label this psycho-social state of mind academically, but how is it to be used? The only use I can see is to spark a moral discussion by calling someone a foreign name and then using their confused response to make your moral point. Thanks for sharing the thoughts of Melanie Joy. Can you send me a mail (see contact page) or message on fb? If by shaming one is referring to questioning the humane myth (e.g. someone who thinks it’s okay to kill animals provided they are ‘humanely raised’) then taking issue with them is okay. But if it is just a sectarian thing, common among leftists (what Freud called “the narcissism of small differences”), then it is harmful to the cause for there to be back-biting. I take offense to animal rights activists being called racists, without evidence or cause, by anti-oppression activists, and find that to be a disturbing pattern. There is also tension between those who advocate violent versus non-violent tactics. Or there is criticism of DXE as a tactic by those who don’t understand its importance and value. Obviously, it’s a movement that’s diverse and there will be differences of opinion that arise. One hopes they can be discussed sensibly. Disruptions of talks are warranted only in the most extreme circumstances, such as when the talk is pro-vivisection, or pro-animal killing. A disruption of a talk by a vegan who promotes animal rights does seem uncalled for. It couldn’t wait to Q & A? So if there was a serious animal rights conference where some of the people argued against animal rights, you think its okay to disrupt their presentations because you disagree with it? There is a lot of inaccurate info RE nutrition in the vegan movement (A LOT! ), and many (most?) AR orgs do not offer accurate nutrition info. As I know how dangerous this lack of info can be, I FEEL very strongly about it. I think all organizations promoting a vegan diet, need to offer at least basic (reliable) nutrition info. And it’s hard to stay “relaxed” about this, as I consider it so important – so I too am “guilty” of toxic perfectionism. And probably many activists feel similar – they find their point of view so important and so right that it’s hard to be “relaxed” about it. Some vegans think I’m anti-vegan, making veganism seem difficult, cynical, or – at best -really boring. Thank you for this insightful essay. I’ve sometimes felt shamed as a vegan (for instance, being vegan isn’t enough) and can also recognize the temptation in myself to shame others from a morally superior standpoint. I do challenge those tendencies in myself. Your essay has come at a perfect time for me, as I have been trying to think my way through some unpleasant experiences. Pingback: Humilier les véganes nuit aux animaux – Peuvent-ils souffrir ? A brilliant and timely find. Not a bad article, I guess. Militant and vigilante vegans & some vegetarians are an absolute selfish, self serving, self-defeating joke. Feel so bad about what the real world and reality is all about huh?….then go seek professional psychiatric help or counselling to help you with your mental psychological problems and stop trying to take out your frustrations on normal, balanced, omnivorous humans. Some vegans are very smart and sensible about their life choices and the way they integrate with the majority of the human race, so my advice is not targeted at those good natured people, only to the dumb, rude and hypocritical vegans…a lot of them out there no doubt. Here is a line they use often…. “You meat eaters react to us vegans negatively to hide your obvious guilt”. Hee Hee….What a load of rubbish. It is the vegans and most vegetarians who actual feel very guilty ….that is why the majority of them switched over from meat eating etc. Go and sulk over the realization of your futility somewhere else and leave humans alone. If you vegans and vegetarians want to win over people with your views and arguments, treat all people with respect and tolerance and show that you are rational and reasonable in your views willing to engage in mature meaningful discussion, otherwise you are just going to be ignored. Omnivores will more likely respect and listen to intelligent and mature people, not dumb disrespectful vegans who give the ‘vegan-movement’ a bad name. Myself…I don’t mind killing and cooking animals for food. Better than eating then alive and raw (YUK! )… like Lions in the wild are able to do with ease. Most humans on planet earth are omnivores, been so for thousands of years. Vegans… lemme see, been around for a relatively short time, are mostly white, young females from affluent first world cities/societies. Not surprising. Like any cultural virus, veganism will slowly spread over the planet but unlikely to have much of an impact, as it’s demise will be due to its lame premise. WONDERFUL! You made many great points. The truth is, because vegans are so angry and consumed by their own darkness (which is understandable, but unfortunate) they are easily triggered and manipulated by “vegan leaders” seeking “Likes” and “Views” and other sort of attention that gets them a “status” and, frequently, money. Veganism aside, it’s more about people’s egos. That’s the big picture. The type of mental abuse, shaming, bullying, trolling, slander and degrading that takes place among “vegans” on social media is ridiculous and harmful for any cause. It’s lame and needs to change. You might want to add that the vegan presenter was shamed for the fact that his organization (VEBU) is promoting vegetarian products (made from 70 % chicken eggs) by a meat company. Many argue that this actually increases the amount of animal suffering over the traditional products of that meat company made from dead animals. In my humble opinion, promoting meat alternatives made from 70 % chicken egg is not exactly a “mainstream vegan” approach, but rather an omnivore approach. While I do not approve of the public shaming as an approach, it also does not seems to be so clear cut to me, if a vegan is being shamed for his non-vegan activities. what do you think Vebu’s/sebastian’s intentions were with supporting (i think only by a product label endorsement, but i may be wrong) these products were, andreas? Can you imagine sebastian and vebu are caring, committed and clever enough to have thought of some good reasons to support it? Or do you think they were just acting on the wrong intentions? Just a question. Yes, as a VEGETARIAN organization they are dedicated to reduce the usage of meat, even if it is only replaced with chicken eggs and thus no improvement for animals is achieved. In fact, the suffering of pigs is simply replaced with the suffering of chickens, and this is certified with the logo “supported by VEBU” that the manufacturer can proudly put on his product. I guess the challenge is that many of the members and supporters of VEBU are omnivores happily consuming eggs and dairy, so while many of the key people might be vegan, they still act vegetarian (likely against their personal convictions). Which is what they were called out for. hi belinda, dogs are omnivores like people and are perfectly capable of being vegetarians. you can get commercial vegetarian dogfood. medically/health wise, there should be no problem. i think it’s a good thing to do. Cats may be more problematic. My cat is eating vegan for 1.5 year now. He is healthy, shiny-furred, energetic 10 year old male. I can only recommend AMICAT (the vegan food I give him). I have been a vegan since becoming an animal activist through supporting several animal charities. I feel somewhat surprised that my Australian friends on FB simply reject posts to help stop the barbaric cruelty which millions of animals are subjected to. I am sick of hearing ” I am not interested in signing any petitions to stop the horrific slaughter of animals.” However, I do receive hundreds of positive responses from young Japanese & Chinese people who want to bring change to giving animals rights! I have seen some positive changes to stop the cruel practices which have been liberating for caged chickens, dolphins imprisoned in Sea World & Greyhound racing in NSW. Due to public pressure Sea World has been closed. Cage eggs have been banned by several major supermarkets & Greyhound Racing has been regulated to stop the cruel practices on these innocent dogs. It breaks my heart to see the horrific cruelty that continues in many civilized countries. When will Animals get the rights they so deserve??? I will continue to support many animal charities bc animals need to protected from being exploited by heartless opportunists! Ghandi a famous Indian prophet said ” A country is as good as the way they treat their animals”! So true! I want to thank you for this post. I have been attacked and shamed by other vegans on multiple occasions; in fact, I’ve left online communities over it. One thing I think we can do is “call out” the aggressors. For example, I had a person make an uncalled-for, name-calling post directed toward me on social media. I flagged the post for bullying. When a rep from a major organization “liked” the bullying post, I sent the person a private message stating that I am on the same side and asked if they really thought that bullying and meanness were the best way to advance veganism. The person did not reply, which is why I think maybe I made them think twice about their support of rude, bullying tactics. What a beautiful world it would be when all of us start to empower each other to take steps to our OWN end station. Giving people a space to grow vs a space to hide. Not because it’s okay to kill animals and you should condone it. But because it works more effective in the broader perspective. Kudos to Dr Melanie Joy! You really do bring joy to the world! Your inputs about the psychology of why we eat meat, and also the impact our vegan or vegetarian food choices has upon the most precious asset we have – namely our relationships – are really far out! I do not have words enough to appreciate the great contribution you have made towards making the world vegetarian. I daresay it is the greatest contribution I have come across thus far! Time will tell – now I actually see how vegetarianism, which is objectively and scientifically the best thing for all people’s health and that of the planet, can come to be the norm – the missing point was this – your compassionate understanding of what it is that keeps people deluding themselves, unknowingly and unintentionally. So your message to the meateaters is not offensive and helps them open that part of their heart which does care for animals welfare, and helps them to connect it to the fact that they do have a choice to make in what they eat, and that they will feel better once they take responsibility for making that choice as well as the consequences it has upon the planet. And your message to the vegans helps them to keep their egos out of it, and to also salvage their relationships which are unexpectedly impacted by this powerful change in their lives. I am so thankful for someone like Dr Melanie Joy. I agree with most of this article, but I must say, someone shamed me and it yanked me out of my self-pity and selfishness into becoming a vegetarian first and then a vegan. I am thankful for those that do have the guts (even sometimes doing it un sensitively) to get some of us to look past our own self centredness and put ourselves in the shoes of the victim. Here I am thankful for Gary Yourofsky who did not mince his words but called a spade a spade and not an agricultural instrument. When we keep ons handling people with soft gloves most of them wont change. Sometimes the reaction is negative but many times those people will go home, think about their life and make drastic changes to their lifestyle, of whom I am one.